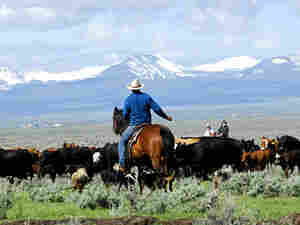 Composing the American Frontier A nation's topography can be linked to its identity and its cultural expression in the arts. In the case of the U.S., the "West" has exercised a central fascination and influence, which is audible in the lean, uncluttered "Western" idiom of symphonic speech. A nation's topography can be linked to its identity and to cultural expression in the arts. In the case of the U.S. — a vast and variegated land plentifully supplied with open space and sky — the "West" has exercised a central fascination and influence. Composers of American concert music, however, were late to discover an iconic West. It wasn't until the inter-war decades that Aaron Copland, Virgil Thomson, and Roy Harris effectively defined a Western idiom of symphonic speech. It was — and is — as spare as the Great Plains, Rocky Mountains, and Mojave Desert. Shunning the cushioned textures of traditional European practice, the musical idea of the West is lean, unadorned, uncluttered. The voices of American chords are widely spaced. American textures are simplified. American harmonies do not drive toward an urgent goal; rather, they relax toward a condition of pastoral stasis or nostalgia. Cowboys and settlers figure prominently in "The Plow that Broke the Plains," Pare Lorentz's classic 1936 documentary about the dustbowl. Thomson's cunning and atmospheric score assembles a patchwork of hymns, of folk and popular song, that's as ineffably American for its informality, humor, and blithe eclecticism as for its guitar, banjo, and saxophones. 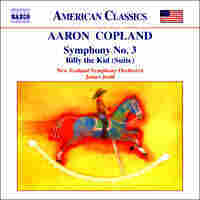 Though Virgil Thomson (as he loved to point out) came first, it was Aaron Copland who popularly established the Western sound in the ballet "Billy the Kid" (1938). Its memorable processional, titled "The Open Prairie," moves from pianissimo to triple-forte, evoking the settlers' advance as an elemental American fact. No previous American composer created anything as remotely iconic of the West as Aaron Copland, Virgil Thomson, or Roy Harris. 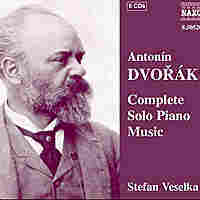 But amazingly, the Czech composer Antonin Dvorak did. An American resident from 1892 to 1895, he undertook to help discover an indigenous symphonic sound, resulting in the famous "New World" Symphony. The third and fourth movements of Dvorak's "American Suite" (for solo piano or orchestra, 1895) draw on cakewalk and the lonely Iowa prairie, respectively. In the fifth and final movement, an Indian dance turns into a minstrel song with (in the piano version) banjo accompaniment. 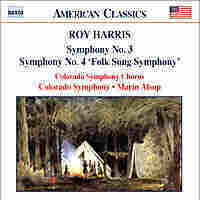 Roy Harris was born on Lincoln's birthday in an Oklahoma log cabin and grew up in California's San Gabriel Valley. Tall, lanky, and rawboned -- and a fledgling farmer before coming late to composing -- Harris actually looked and acted the part of a Western composer. In his signature "Third Symphony" (1938-39), a loping, striding cello song probes the surrounding silence. The long melodic lines and open textures of Harris' symphony suggest an American plainchant (pun and all). 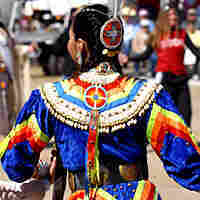 Arthur Farwell, who declared himself the first American to take up Dvorak's challenge to develop a uniquely "American" sound, left at least two memorable Indianist vignettes: "Navajo Dance No. 2" and "Pawnee Horses," in versions for both solo piano and a cappella chorus. The latter, especially, is a tour de force, both primal and complex. But these sinewy pieces remain unknown, buried under the mountain of kitsch that musical Indianism became.